Although it is hard to believe given his prolific writing and his remarkable fitness, American-German conflicts giant Professor Dr. Dr. h.c. mult. Peter Hay has actually celebrated his eightieth birthday on 17 September this year in Berlin. 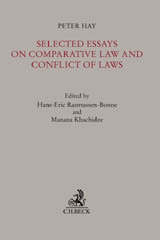 On this occasion, he has been honoured by a publication of Selected Essays on Comparative Law and Conflict of Laws, edited by Hans-Eric Rasmussen-Bonne and Manana Khachidze. For further information, click here. This volume is a collection of articles, case notes and book reviews authored by Professor Hay, both in English and in German. The contributions cover the whole range of his academic interests, mainly private international law, comparative law and international civil procedure. Taken together, they provide a fascinating view of the development of private international law and comparative law in recent decades, from the U.S. conflicts revolution in the 1960’s to the Europeanization of conflict of laws since the Treaty of Amsterdam. This book is a testimony to a truly impressive lifetime achievement, and it is to be hoped that many more contributions will be added in the future. Ad multos annos!